Everything You Need To Know About Sony PS4 PlayStation Console…! Sony manufacturers always provide the best gadgets to its customers. These devices are also included the home appliances. The main electronic devices by Sony are smartphones, laptops, TV, refrigerators etc. Now Sony is going to release Sony PS4 PlayStation Console. The Sony PS4 Console is an eighth generation home video game console that is developed by Sony Company. Almost 500 million PlayStation consoles were sold in the last few decades. Therefore, now Sony is going to release a new Sony PS4 PlayStation Console for its consumers. The complete details of Sony PS4 PlayStation Console are here. You should must check out these details before purchasing it. Sony Company is releasing a styling and translucent Sony PS4 PlayStation Console Pro. 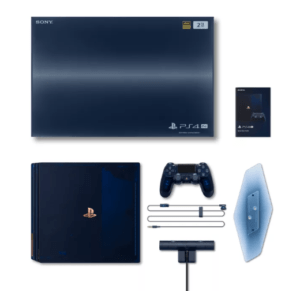 The console and controller are also here, the surrounding sides of Sony PS4 PlayStation Console are covered with plastic with a very fetching shade of dark blue. A bronze plate is also used in Sony PS4 PlayStation Console at the front side with serial number on it. The new Sony PS4 Console includes a 2TB PS4 Pro, Dualshock 4 and PlayStation camera. The controller can be purchased as individually and a Gold Wireless headset which has the similar transparent casing as the Sony PS4 Console. The main purpose of all the PlayStations is to provide the best gaming platform and now it’s possible with Sony PlayStation 4. Sony makes the PS4 Pro the best of the best. It has the 4K gaming and entertainment, High Dynamic Range for intensely vibrant colors and Double the GPU power of the standard PS4. The Sony PlayStation 4pro has the stunning graphics with HDR Technology. The new Sony PS4 Console would only be available in a limited number as only 50000 in all over the world. So hurry up and go for purchasing this new PlayStation for playing games. The limited amount of Sony PS4 Console would go on sale firstly in US and Canada on 24th August 2018.